There’s a new monorail in town here at Walt Disney World Resort that you’ve just gotta see! 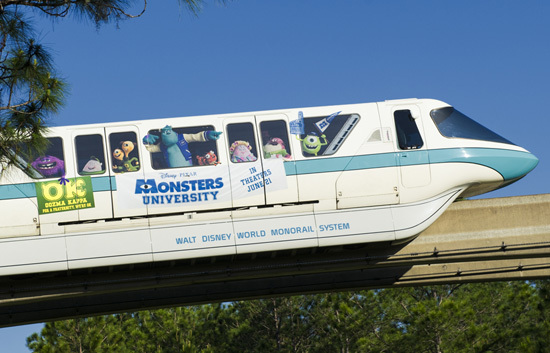 One of the monorails on the Magic Kingdom Park/Resorts loop now features the cast of Disney•Pixar’s new movie “Monsters University,” including Mike, Sulley and a host of new characters you’ll meet when it comes to theaters June 21. Last time we saw them on-screen, Mike Wazowski and James P. Sullivan seemed to be an inseparable pair, but that wasn’t always the case. From the moment these two mismatched monsters met they couldn’t stand each other – and that’s the story told in “Monsters University,” which lets us take a fun look back at how Mike and Sulley met and eventually became the best of friends.